EPDM stands for: ethylene propylene diene monomer. This is an “M” class rubber, which has many applications. 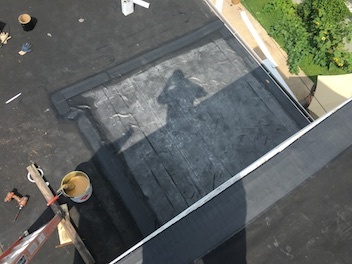 Here, it has been used on a flat roof, which we will remove sections of to fix a leak and instal new EPDM. Old material removal. Isolating the areas that are damaged and fully removing each section of the leak under the roof, including the decking. 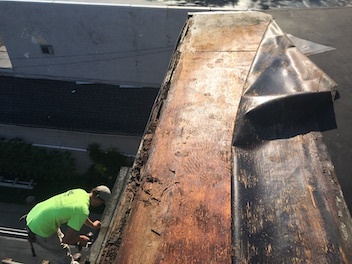 Replacing rotted decking underneath both sections of the roof to ensure the leak is entirely gone. (This is the first section). 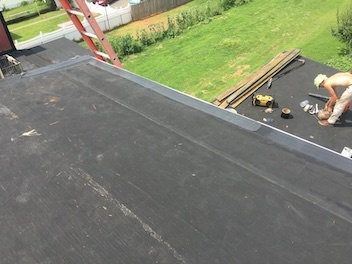 Here, you can see the new black rubber roofing material is now in place! Both sections are tightly sealed off with brand new materials. No more leaks into the home! If you or anyone you know has a new leak or a leak that has persisted into their home for years and they can’t find the source, give XL Home Improvements a call immediately! We have helped hundreds of home owners stop thousands of leaks and we won’t stop until the problem is properly resolved! Check out our testimonial page! This entry was posted in ROOF REPAIR, STUFF TO CHECK OUT! 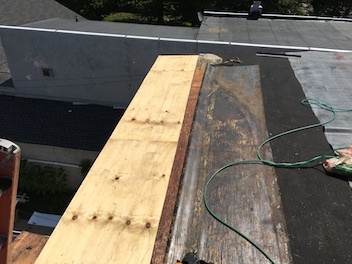 and tagged construction, DeWalt, EPDM, flat roof, Home Improvement, ladder, leak, leaky roof, patch, Pennsylvania, Pottstown, roof leak, Roof Repair, roofer, Roofing, roofing materials, waterproof, weatherproof, XLHomeImprovements on October 1, 2017 by Rut327.